Here at Christmas in July we want to know what offerings you have to Cupid and a little about the item. Roses Workshop from RosesWorkshop says I love roses, but they don’t bloom naturally in February in the UK. I have created one that will last all year long, and packaged it in a perfect little heart-shaped gift box. Stock Lane Studio from StockLaneStudio said To me, chocolate is a big part of Valentine’s day. It’s a must-have all year long, every day!! (in my dreams). Dangle a good piece of chocolate in front of me and I have been known to change my mind. Marjorie Scenna from mscenna states red hearts are symbolic of Valentine’s Day and a heart shaped gift is perfect. This red one of a kind glass beaded key chain is a great gift idea! Lia Russo from Ghirlandiamo discusses how On Valentine’s Day people generally buy gifts or flowers: that’s very nice, but l think there are also other ways to celebrate this romantic day. l prepared these tiny wreaths with hearts thinking of an intimate romantic dinner and a smart table set with little, particular accents, like napkin holders. Carola Bartz from CarolaBartz says I love to remember my daughter when she still went to elementary school and each child brought little Valentines for the classroom Valentine party. I always made mini cards and then my daughter would sit at the table and write the names of her classmates on the cards. She was so concentrated on the job, the tip of her tongue wandered from one corner of her mouth to the other. She was happy when she was done and hadn’t messed up. Tanya Hardman from TheWoollyTangle states I love this since it’s one of the first items I made that looked how I saw it in my head! Hangs on a lovely quirky angle and moves wonderfully with you. Dawn Whitehand from DeeDeeDeesigns discussed how I have lots of Valentine gift ideas in my shop for him and her….necklaces, rings… and even tableware for that romantic dinner!! Annie from DesignedbyAnneliese says I had fun putting together these Valentines day themed mini cards. Ina from InaSudjana states that Love should be celebrated every.single.day. So we should really have valentines day every day! Appreciating our loved ones daily, appreciating our friends and appreciating everything that we have really. Here’s one wall hanging that can help us remember to celebrate love! Melissa R from missy69 says I am still very new to wood burning, but I wanted to make a few things for Valentines Day. This is just a simple wooden picture block, with Calla Lilies, Roses, and hearts wood burned to the block. There is a spot for personalizing, too. Next, I thought about how other sea creatures might say “I Love You”. Surely, they would need to spell it out with their bodies. So, when the card is opened, a jelly fish in the shape of an “I”, an octopus holding a red heart, and an eel in the shape of an “U” pop forth in bright colors to say “I love you”. Evelyn and Lucy from artsyEve states I think this quilt would be perfect for Valentine’s day–perhaps for a February baby or for an older friend to use as a lap quilt. It’s beautifully made with appliqued hearts–perfect for Valentine’s Day! Mandi Leighs from leighswiccanboutique says Love is in the air and valentines day is just around the corner fast approaching. Why not go out of the normal and get her something that not only smells fantastic but is equally beautiful as well. This candle holder was created from found materials to create this unique piece adorn with crystal Quartz, Emerald, Black Onyx and Agate. Filled with a unique of Dragons Blood and Wine. The best part is once this candle is gone the holder is reusable with your favorite tealights or votive candles. A gift that can be used over and over again. Woolly Momo from WoollyMomo states that I think giving your loved one the gift of warmth and comfort is once of the nicest things you can give them. Valentine’s Day is always so cold here in London and so, in keeping with the red theme of Valentine’s Day, I knit this lovely red hat in a soft and cozy wool to keep a lover warm as the go out and about to celebrate with their much loved other half! Sue and Misty from shabbyshopgirls state we love vintage Valentine’s Day cards and postcards! The sayings/greetings are so sweet and creative from years past. This is one of our favorites featuring a huge heart with a lid! Hope she finds some LOVE in there! National Bird Day was established by bird activists. It calls upon people to recognize the plight of captive birds. It also draws attention to exploitation of birds in the U.S. pet industry. On this day, organizers suggest we reflect upon the conditions of birds held in captivity. 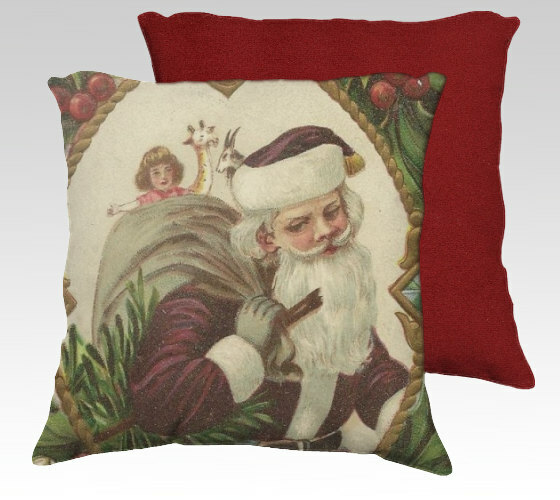 Here at Christmas in July we want to see your bird items and the story behind your piece. We love this hankie by Pat Prichard that features “Birds in Bird Cages”. We’re sure that these birds singing about how they love their home and bird-cage! They do seem to have some pretty fancy cages! This handsome fellow spent most of the year in our hardwoods, much to the annoyance of my chickens. This lovely moment of repose was captured on a blustery winter day just outside my bedroom window. Just look at those eyes! I have always enjoyed the sound of the birds singing to greet the morning and twittering their evening song. These birds on a wire remind me of those musical moments and the joys of nature. These little bird charms were designed as a collaboration with an Etsyian, Piggledee. I personally love bright colours. They bring joy and being a charm they ‘pop’ in an otherwise ordinary bag. Santa Claus… Saint Nicholas… Sinter Klaas… Pere Noel… Father Christmas… Because Santa is viewed so differently in different countries and cultures, I turned to my Christmas in July Team Members to learn more about their Santa and Holiday Traditions. Personally, I make a point every year to visit with Santa and get my picture taken. When I think of Christmas, that is definitely one of the things I get really excited about! And though I have a grown up Christmas list, I always ask for the same thing – Peace and Happiness. 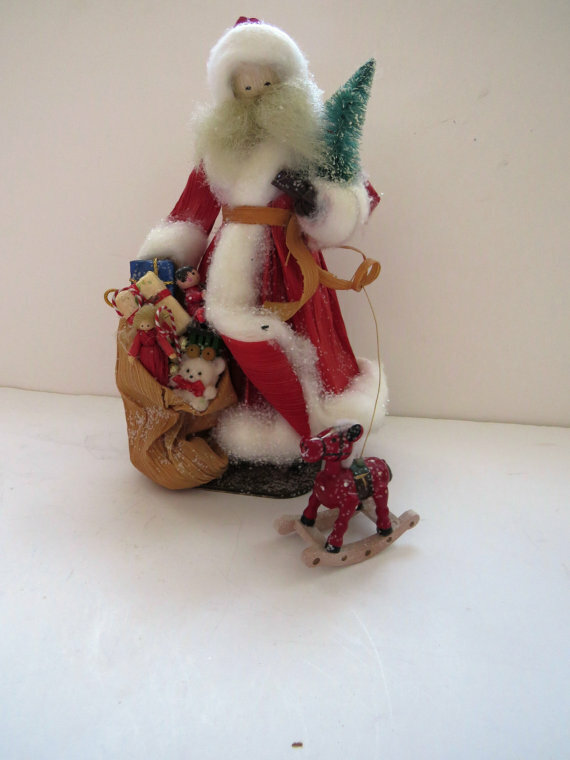 I chose to feature the Santa suit in my Santa Bauble Ornaments (shown above) because it was the first thing that came to mind when I thought of my visit with him. How soft the red velvety suit is, with the fun, fluffy white trim. 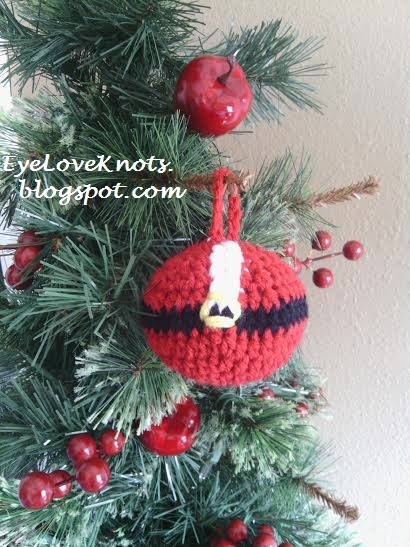 I had a lot of fun working up these bauble ornaments for gifting and have since made a few for my own tree. 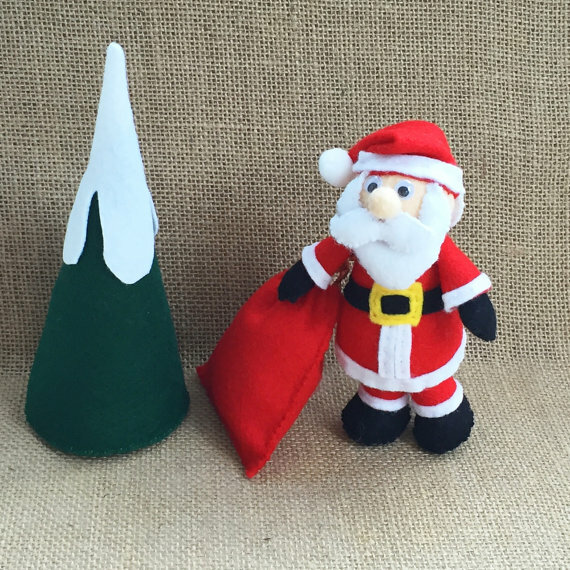 Let’s see what other Christmas in July Members are sharing with us about their Santa and Holiday Traditions! 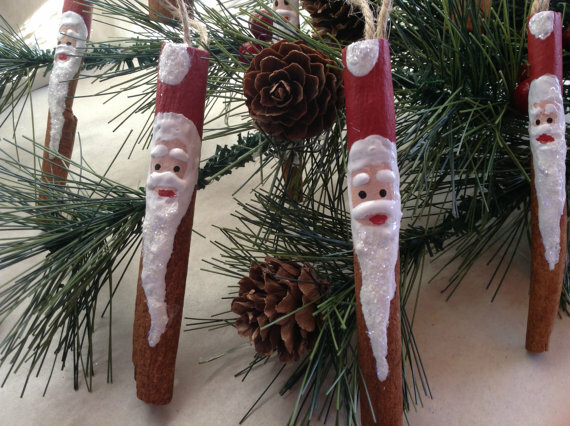 Do you have a special holiday item that represents your Santa or Holiday Tradition? 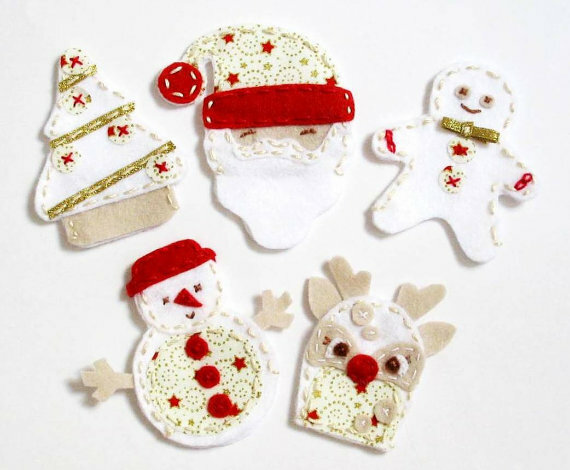 Maybe you make a special type of Christmas Cookie for Santa, or leave out a treat for the Reindeer. I would love to hear about it! Share your story below. 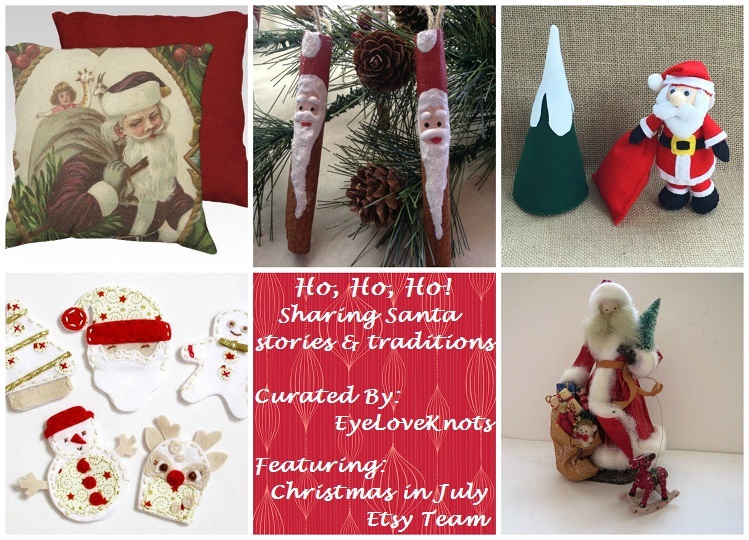 Here at Christmas in July we decided to do a Listing Blitz a bit differently! We made the blitz become a story revolving around the blitz listings. There were specific rules to follow, but mostly the purpose was to blitz (promote) the other members listings as much as possible. My BE THANKFUL banner gives a wonderful message during the Thanksgiving season. My granddaughter last year made one for her teacher to hang in the classroom… when I gave her 3 choices… HAPPY THANKSGIVING, GIVE THANKS, BE THANKFUL… she choice BE THANKFUL and she said that a lot of the kids in her class need to BE THANKFUL for what they have and are not. A good rule for all of us. I am thankful for all of those things and also the cooler weather and the beautiful color changes around us. Leaves are falling and the landscape takes on the beautiful colors of the fall. We all need an Angel. This Angel use to be out every year a top a Christmas Tree. The past two Seasons she has not been on display. The crown is just for fun. And as the angel looked down from the tree, the family gathered round the table for a Christmas feast. The ham was cooked, the bread was broken and the good china came out of the cabinet …. Sharing a meal as a family and enjoying each other’s company is the best part of every holiday and something to be truly thankful for. Set your table with a personalized touch and invite others.